Western Engineering professor Andy Sun welcomed to campus members of the China Automotive Battery Research Institute Co. Ltd (CABRI) to celebrate the opening of GLABAT Solid-State Battery Inc., located in the Western Research Park. Western Engineering PhD candidate Elena Uchiteleva recently received the Senior Women Academic Administrators of Canada Graduate Student Award of Merit for her dedicated work and continued advocacy efforts. Catherine Karakatsanis, BESc'83, MESc'91, is the 2019 recipient of the Engineers Canada Gold Medal Award, to recognize her profound contributions to the profession and her community. Western's Boundary Layer Wind Tunnel has officially been recognized as a National Historic Site by the Canadian Society for Civil Engineering and an International Historic Landmark by the American Society of Civil Engineers. Western Chemical Engineering professor Kibret Mequanint is part of a research project looking at creating the first-ever nanocomposite biomaterial heart-valve, which looks to reduce complications related to the surgery. Vivian Yoanidis, Director of Diversity & Inclusion at Hydro One, addressed support for women in male dominated fields at Western Engineering's 28th annual Lynda Shaw Memorial Lecture. On March 21, Western held its annual Three Minute Thesis (3MT) Finals competition at the Wolf Performance Hall, where seven graduate students from Western Engineering placed as Top 20 finalists and competed in the campus-wide 3MT competition. We caught up with Matthew Crossan, BESc’15 and MESc’18, to learn about his time with the Infiniti Engineering Academy, discover more about his current role at Renault F1, and hear about his overall Western Engineering student experience. Chemical and Biochemical Engineering professor Jose Herrera has received the 2019 Edward G. Pleva Award for Excellence in Teaching – Western’s highest honour for faculty who inspire active and deep learning in their students. We spoke with second-year integrated engineering student Elijah Dietrich to hear about his experience as a recent attendee at the annual United Nations Climate Change Conference (COP24), held in Katowice, Poland. The Lynda Shaw Memorial Distinguished Lecture Series was established in memory of Lynda Shaw, a third-year mechanical engineering student at Western who was murdered near Highway 401 in 1990. Andrew Bebnowski, Jackson Chin and Karn Kalra are the winning Western’s World’s Challenge Challenge team for their bridge-building plan, through the Western Engineers in Action club. Western Engineering alumna Shivani Chotalia, BESc/HBA'15, is the epitome of what it means to "carpe diem." We caught up with Shivani to learn more about her time at Western and how she landed her current role as Senior Energy Storage Analyst at NRStor Inc.
During the week of January 30 to February 3, 2019, 30 members from the Western Engineering Toboggan Team (WETT) travelled to Edmonton, Alberta to compete in the 45th annual Great Northern Concrete Toboggan Race with teams of students from across the country. 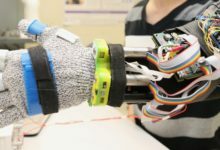 Western Engineering professor Ryan Willing and his international research team have developed a new smart implant that could greatly reduce knee replacement surgeries. Two inaugural Thompson Fellows have recently been appointed to the Centre of Engineering Leadership and Innovation to aid in the Centre’s development and program integration. Multiple teams comprised of Western Engineering undergraduate students competed at the 2019 Ontario Engineering Competition (OEC), hosted at McMaster University on the weekend of January 18-20, 2019. Led by Engineering professor Greg Kopp, the Northern Tornadoes Project looks has spun into a nationwide mission to identify every Canadian tornado in 2019. On December 14, 2018, university researchers, industrial experts from the nuclear power industry and representatives from NSERC gathered for the 14th Annual University Network of Excellence in Nuclear Engineering (UNENE) Workshop on Instrumentation and Control. Students, faculty and staff gathered solemnly at different places on campus Thursday to commemorate the National Day of Remembrance and Action on Violence Against Women. Chief Technology Officer at Mircom Group Jason Falbo's passion for lifelong learning inspired him to return to Western Engineering as a graduate student, where he's currently completing his PhD. The first 10 winners of the Linamar Scholarships for Women in Engineering and Business have officially been named. Ashraf El Damatty, Professor and Chair in the Department of Civil and Environmental Engineering, received the 2018 Engineering Medal for Research and Development, presented by Professional Engineers Ontario. Canada Research Chairs (CRCs) highlight world-changing science and innovation. Three Western Engineering faculty are among the seven researchers to be newly named, or newly renewed, Canada Research Chairs. Eight Western Engineering students from the Western Baja SAE race team competed in the 10th annual Louisville Midnight Mayhem race, where they won 2nd place out 100 teams across North America. Western’s newest facility – the Amit Chakma Engineering Building – has won a provincial award of excellence for new green buildings. Kelsey Crawford, BESc’19 candidate, is this year’s recipient of a $5,000 scholarship and the Canadian Engineering Memorial Foundation (CEMF) Engineering Ambassador Award for the Ontario region. Western president Amit Chakma was honoured as University Chancellor, Jack Cowin, BA’64, LLD’00, and his wife, Sharon, BA’64, announced they've donated $5 million to support Western Engineering and to name Western’s newest building the Amit Chakma Engineering Building. 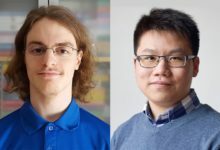 Two Western Engineering graduates are among the three Western graduates who have received this year's Governor General’s Academic Gold Medals for their outstanding scholastic achievements. We spoke with Western Engineering alumnae Olivia Gillis, BESc’17, and Elaine Samuel, BESc’13 & MESc’16, to delve into everything from their day-to-day work tasks, to their Western Engineering student experience, to what inspired them to start their blog, EngGirlProblems. Software Engineering professor Aleksander Essex stresses there is no way to optimize electronic voting. You cannot overcome voting as a cybersecurity concern, he says. Structural Engineering PhD student Sarah Stevenson is one of five Western PhD candidates among 167 nationwide recipients of the 2018-19 Vanier Canada Graduate Scholarships. Western Engineering Outreach was successful in its PromoScience application for the expansion of Women in Engineering outreach programs. PromoScience, offered by NSERC, financially supports organizations that promote STEM fields to young Canadians. Kristen Edwards, Graduate Coordinator for the Civil and Environmental Engineering Department, is a recipient of one of the 2018 Western Awards of Excellence, the highest honour for staff member achievement. For the second year running, Western Engineering Outreach has been awarded a grant from Libro Credit Union as part of its investment in programs and communities across southwestern Ontario. In Western's latest edition of Bookmarks, the spotlight is on alumnus Gordon Stein, BESc'84, author of Cashflow Cookbook and Senior VP (Global Sales) at Pronto Forms. The Western Engineering community raised almost $50,000 towards an Engineering Gold Medal in honour of former Dean Andrew Hrymak. Western Engineering recently hosted its inaugural Undergraduate Summer Research Day, where some of the 2018 summer research students participated in three-minute-thesis-style presentations and created posters to share their work conducted over the last few months. Tony Xu and Ryan Harlen, two of the nation’s highest achieving secondary students, will begin their undergraduate studies at Western this fall as recipients of prestigious Schulich Leaders Scholarships. The 2018 recipient of the L.S. Lauchland Engineering Alumni Medal is Jeff Westeinde, BESc’89, investor, entrepreneur and President of Zibi Canada, one of the world’s most sustainable mixed-use development projects. A team of Western Engineering researchers, led by Civil and Environmental Professor Girma Bitsuamlak, recently acquired an advanced 3D printer with the capability of printing a variety of complex architectural and civil structure models. Western Engineering is pleased to announce that Dr. Greg Kopp will serve in Hrymak’s place as Acting Dean of the Faculty of Engineering for the period of August 1, 2018, to June 30, 2019. Effective July 1, 2018, Western Engineering welcomed three new faculty members to its team. What started out as a fourth-year undergraduate engineering project is now a fully developed medtech startup, AHead Simulations. Effective July 1, 2018, Dr. Jeff Wood assumed the role of Associate Dean, Undergraduate Studies in the Faculty of Engineering for a five-year term. Wood will take over for Dr. Michael Bartlett, who served in the role for the past five years. 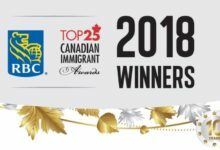 Western alumni Kundan Joshi, BESc’04 (Software Engineering), founder and CEO of TheAppLabb, and Dr. Boluwaji Ogunyemi, BSc’08 (Medical Sciences & Sociology), a dermatologist, have been named among the 10th annual RBC Top 25 Canadian Immigrants, a list that includes other artists, academics, entrepreneurs and champions of worthy causes. Future Focused: What’s next for Western Engineering? Western Engineering is gearing up for an exciting year of new initiatives and opportunities for its students. Kundan Joshi, BESc’04, immigrated with his family from Mumbai to Canada in 2000, moving here to pursue his software engineering degree here at Western. 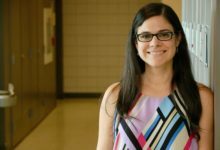 Engineering professor Ana Luisa Trejos, Health Sciences professor Jayne Garland, along with Evan Friedman of Intronix Technologies, have received a Collaborative Health Research Projects grant to look into creating a wearable device that assists with the suppression of tremor in Parkinson’s patients. 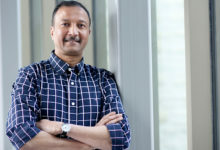 The Canadian Institutes of Health Research (CIHR) and the National Science and Engineering Research Council (NSERC) have awarded a pair of Western research groups with Collaborative Health Research Projects operating grants. A research group led by Schulich School of Medicine & Dentistry professor Douglas Hamilton, right, and Schulich/Engineering professor Amin Rizkalla, recently received $697,970 over three-year term from the Canadian Institutes of Health Research (CIHR) and the National Science and Engineering Research Council (NSERC) partnered grant. On June 18, 2018, Electrical and Computer Engineering Professor Xianbin Wang and Mechanical and Materials Engineering Professor Jun Yang were among the 59 new Fellows inducted into the Canadian Academy of Engineering (CAE). The foosball market is growing worldwide year after year and is expected to reach over $460 million USD by 2021. However, table sports all share one major disadvantage: players can’t play on their own. Western Engineering will continue to lead the charge in mitigating the effects of pollution on the environment and public health with today’s announcement of a $1-million donation from The Salamander Foundation. At Western, we understand that the next generation of engineers require not only the technical skills of their predecessors, but a broad set of skills, including team and leadership development; communication; ethics and equity; entrepreneurship; and business. 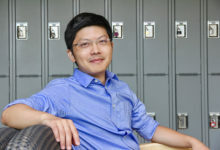 Mechanical and Materials Engineering Professor Xueliang (Andy) Sun recently received a $4 million grant from the Ontario Research Fund (ORF) for his work in developing solid-state batteries used for electric vehicles. Each year the Faculty presents the Engineering Award of Recognition to individuals (or teams) who have made an exceptional contribution in the past year to help further the academic, research and innovation, public service and/or administrative missions of the Faculty. We spoke with Western Engineering alumna Rebecca Dean, BESc’13, who currently works as a ride and show engineer at Universal Creative in Orlando, Florida. The Sharon A. Ling Award of Excellence for Outstanding Achievement by a Staff Member is presented annually to a Western Engineering employee to recognize their exceptional long-term contributions in support of the academic, research, innovation, public service or administrative missions of the Faculty of Engineering. Natalie Rebot, BESc’05, created the wildly successful Moonlite, a storybook projector that displays classics such as Good Night, Moon through a cellphone flashlight and app. 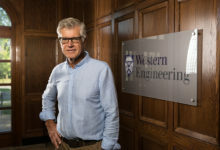 Each year, Western Engineering presents a faculty member with the Engineering Award for Excellence in Research to recognize their outstanding research contributions. This year’s recipient is Chemical and Biochemical Engineering professor Kibret Mequanint. Western University recently announced its partnership with Nunavut Arctic College as participants in a Canadian Space Agency (CSA) project, where teams of professors and students take part in a real space mission. Western received one of 15 CSA-funded grants to build a miniature satellite called a CubeSat. Western's Boundary Layer Wind Tunnel Laboratory has been recognized as both a National Historic Site by the Canadian Society for Civil Engineering and an International Historic Landmark by the American Society of Civil Engineers. The Water Environment Association of Ontario (WEAO) recently held its annual conference, where students and industry professionals came together to network and celebrate their peers’ successes in the field. 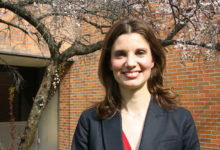 Chemical and Biochemical Engineering professor Elizabeth Gillies is this year’s recipient of the R. Mohan Mathur Award for Excellence in Teaching. Civil and Environmental Engineering professor Jason Gerhard is one of two Western researchers who have been honoured among the winners of six Natural Sciences and Engineering Research Council of Canada (NSERC) six national prizes. Following an extensive ground and aerial survey led by wind engineering experts at Western, it has been determined that the tornado outbreak of June 18, 2017 in southern Québec is officially the largest recorded in the province’s history and, consequently, one of the largest ever recorded in Canada. On April 11, 2018, Western Engineering hosted its inaugural Graduate Awards Banquet to recognize its students for their hard work and recent successes. Western University’s Thompson Arena was recently transformed from a quiet and cold ice surface to a rowdy battle pit for mechanical gladiators controlled by teams of high school students who acted as mechatronic creators and robot-pilots. Many Canadians suffer from vascular diseases such as high blood pressure, heart attack, and stroke. When patients are diagnosed with vessel-related heart problems, they are treated with either angioplasty to open clogged arteries, or, in more severe cases, bypass surgery to redirect the blood flow. 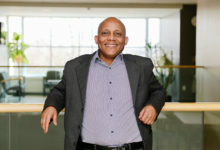 Chemical and Biochemical Engineering professor Kibret Mequanint has been inducted into the American Institute for Medical and Biological Engineering’s (AIMBE) College of Fellows for distinguished contributions in biomaterial design and the applications of biopolymers to medicine. He is one of just 18 Canadian engineers – and the first from Western – to be part of the U.S-based non-profit organization. 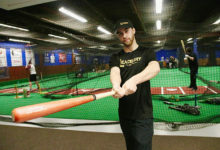 Third-year Western Engineering student Mitchell Godkin is hoping to hit a homerun with his latest entrepreneurial endeavour, the Leadbury Bat Co., a premium baseball bat manufacturing company located just north of Seaforth. Western’s Teaching Fellows are outstanding educators who, in partnership with the Teaching Support Centre, provide educational leadership to the university community through research on teaching and learning. Each year, Western’s Chemical Engineering Club conducts student surveys for the Best Course Instructor and the Best Graduate Teaching Assistant Awards, as voted by Chemical and Biochemical Engineering (CBE) undergraduate students in 2nd, 3rd and 4th year. Environmental Engineering Professor Clare Robinson is among this year’s winners of the Western Green Awards for playing a key role in developing and delivering curriculum focused on sustainability and environmental issues. The Three Minute Thesis (3MT) Competition is a series of three-minute talks by Western University graduate students who discuss their exciting research and creative activities. On March 22, 2018, Western Engineering held its 27th annual Lynda Shaw Memorial Lecture to honour the life of Lynda Shaw, a third-year mechanical engineering student at Western who was murdered near Highway 401 in 1990. Professor Jin Jiang is one of four professors who are the latest recipients of Distinguished University Professorships (DUP) awards, joining a select group of faculty members recognized for exceptional scholarly careers. March 22 is recognized internationally as World Water Day. Most Canadians likely aren’t even thinking about water in their day-to-day lives. However, those who work in this field are thinking about water, in all forms, 365 days a year. On March 8, 2018, Western Engineering welcomed Professor Zhong Lin Wang, Regents Professor and Hightower Chair at the School of Materials Science and Engineering, Georgia Institute of Technology, for its annual Faculty Distinguished Lecture. 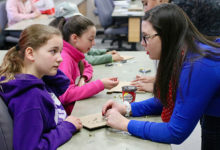 Aspiring engineer Hannah VanderPloeg, left, received a little advice from Western’s Women in Engineering outreach program coordinator Kelsey Lavigne as the pair worked on creating buzzing paperclip circuits, part of the Go CODE Girl event at Western Engineering. Sara Holland, a master’s student in the Department of Mechanical and Materials Engineering, is analyzing whether arthritis grips marketed as having low force and low impact actually benefit people with arthritis. Today, on International Women’s Day, Hydro One has announced both the winners of the Hydro One Women in Engineering Scholarships and the renewal of its Women in Engineering University Partnership — Two major initiatives that Western Engineering is proud to be involved with. 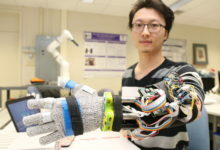 Biomedical Engineering PhD student Yue Zhou of the Wearable Biomechatronics Laboratory Group models a prototype for wearable tremor suppression glove. 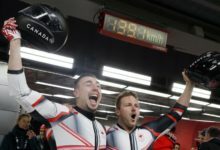 Alex Kopacz, BESc’13 (Mechanical Engineering), and Justin Kripps captured gold late Monday for Canada’s third-ever Olympic medal in men’s 2-Man Bobsleigh. Western hopes to gain a boost in leading advanced-manufacturing research through partnerships with industry that will vie for a share of $950 million in new funding through the Innovation Superclusters Initiative. Western Engineering congratulates eight of its undergraduate students who brought home first place at the 2018 Ontario Engineering Competition (OEC), hosted by the University of Ottawa, January 25-28. Students across the country, including one from Western Engineering, are getting out of the labs and behind the camera for the annual Science, Action! initiative, sponsored by the NSERC) to highlight how research improves our daily lives. In five years, Alex Kopacz went from being a 23-year old Western undergrad who had never seen a bobsleigh, to a Team Canada Olympian waiting his turn on the international stage in Pyeongchang, South Korea. Haojie Mao, Mechanical and Materials Engineering professor and Canada Research Chair in Head Mechanics, is working to understand traumatic brain injury and improve brain health with better protection, diagnostics and therapies. Named to head the park earlier this month, Katherine Albion, PhD’08, hopes she can build on that momentum and expand the park’s academic and industry partnerships in the region, as well as its collaboration with Western. From the tobacco fields of a small town in southern Ontario, to the oil fields of Alberta and Texas, the journey for Anthony Vysniauskas, BESc’74, MESc’76, began with an idea that had nothing to do with business. 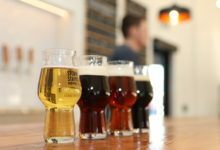 Mechanical & Materials and Electrical & Computer Engineering professor Michael Naish has taken his love for beer and turned it into London’s latest craft brewery – Storm Stayed Brewing Company. Western Engineering’s Outreach program is set to receive a generous and staggering contribution of $175,000 from Actua, a national charity dedicated to preparing the youth of Canada for any career path by building the foundations of knowledge in Science, Technology, Engineering, and Math (STEM). Mechanical and Materials Engineering professor Hamidreza Abdolvand has discovered never-before-seen deformation and stress levels in two technologically important materials – titanium and zirconium – used in the aerospace and nuclear industries. Western Engineering is proud to announce that our Undergraduate Services team has received the NACADA Region 5 Innovation in Advising Award for its outstanding work in building and implementing the Engineering Resilience Program for our undergraduate students. Western Engineering is pleased to share the news that, effective January 2, 2018, The County of Lambton Community Development Corporation (CLCDC) Board of Directors named alumna Katherine Albion, Executive Director of the Western Sarnia-Lambton Research Park. Western Engineering professor Aaron Price and PhD candidate Ben Holness capitalize on funding provided by the Peter Maurice Fellowship to develop 3D-printing techniques for conductive polymers used in the early detection of glaucoma. As a small boy, Jon Kissi, a Western Engineering PhD student, was a self-proclaimed ‘space geek’. A Star Trek fan, a lover of all things science and outer space, he dreamed of a world far beyond his own front door. Professor Jim Johnson honoured for research contributions. Award reception brings together students, faculty and alumni with Entrepreneurial Spirit. Don’t try to keep up with Ysni Semsedini on his fast track. Western Engineering professor Elizabeth Gillies has received the E.W.R. Steacie Memorial Fellowship. Elizabeth Gillies’ development of degradable polymers (plastic) could soon benefit everything from fertilizer used by farmers to cancer drugs administered by physicians. A modern, dedicated space that encourages innovation and collaboration among software engineering students is what young alumnus James Harquail, BESc’15, envisioned when he proposed his family foundation support Western’s new Engineering building. Western Engineering Toboggan Team set to compete in Winnipeg. The Western Engineering Toboggan Team (WETT) is once again poised to compete at the annual Great Northern Concrete Toboggan Race (GNCTR). Family Engineering tradition continues into a new generation. Western asks faculty, staff to 'Speak' up. Western faculty and staff will again have their say about how satisfied they are at work. Environmental Engineering graduate student Ahmed Abuhussein recently spent five months in the west African country of Ghana where he addressed gaps in applying treated wastewater in agriculture at city level. The Engineering Institute of Canada (EIC) announced recently that Professor Ashraf El Damatty, Chair of the Department of Civil and Environmental Engineering at Western has been inducted as an EIC Fellow. Retirement is not slowing down Hanny Hassan. A consulting engineer by trade, Hanny A. Hassan, C.M., BESc’64 (Civil), is currently managing an independent consulting engineering practice, Alef Consulting Inc., and is a long-time volunteer promoting understanding between cultures and religions. He is also the recipient of the 2013 L.S. Lauchland Engineering Alumni Medal. The Western Engineering Toboggan Team unveiled their design on Jan. 8 for the 2013 Great Northern Concrete Toboggan Race to be held in Vancouver Jan. 23-27. The team also team performed three test runs on University College (UC) Hill. Lauren Hasegawa, a fourth-year civil engineering student, has hit the ground running as one of six Western students selected as part of ‘The Next 36,’ an entrepreneur incubator for innovative Canadian undergraduates. Down not afraid of "doing things the hard way"
As a Production Engineer in Training, LANXESS Inc. - Olefins Business in Sarnia, Ont., Katherine Down, BESc’12 (Chemical), feeds her curiosity on a daily basis. 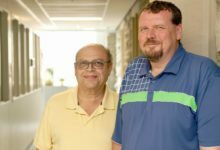 Western’s Civil and Environmental Engineering incoming chair Ashraf El Damatty and professor Michael Bartlett, in partnership with Morrison Hershfield, will lead a total of five training sessions for approximately 80 Ontario Ministry of Transportation (MTO) structural engineers and other MTO staff. Mark Carney, BESc'08 (Civil), was part of an extensive team who installed the Concord Cityplace Skybridge in June 2012 using Strand Jacks housed in the penthouse of each building. Western University has recently launched a new ad campaign to showcase The Western Experience. I would like to welcome you to the inaugural eNewsletter of the Boundary Layer Wind Tunnel Laboratory (BLWTL) at Western University.